Earthless went big in 2018 releasing their first album with vocals, Black Heaven and this celebratory live album follow up, From The West. Unlike a lot of metal/stoner outfits who use studio precision to get their ideas across, Earthless have always been more akin to Jambands, doing their most exciting and raw work on the live stage. 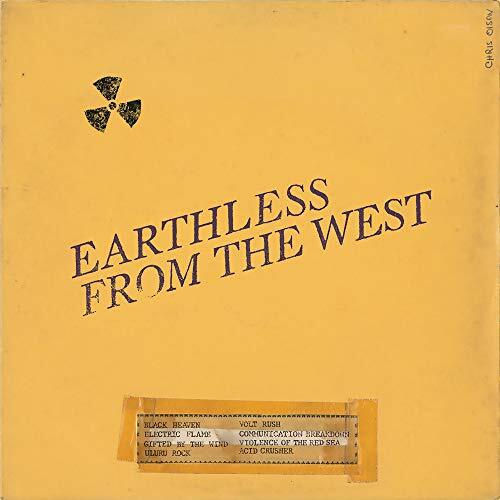 From The West is the bands third official live album (with many bootlegs and jams floating around) and it is an upgrade over Black Heaven (which did have much better cover art though) if for the blistering energy alone. The ripping newest instrumental "Black Heaven" kicks things off with surging energy as the frantic riffs of Isaiah Mitchell combines perfectly with the rolling thunder low end of bassist Mike Eginton and drummer Mario Rubalcaba. The opener flows smoothly into "Electric Flame" and while the lyrics and singing of Mitchell are pushed more into the background, their Black Sabbath qualities are actually pushed more to the forefront, accentuating the playing rather then dominating it. The squirrelly feedback wrapping up "Electric Flame" drips into the pounding grooves of "Gifted By The Wind" but it is the massive "Uluru Rock" which dominates this album. Pushing twenty minutes this behemoth is a heavy psychedelic journey, with both glimpses of darkness and beauty. It trudges along with Brontosaurus like stature and heft while Mitchell is just wailing away at the universe as the tempo slowly rises and rises before soaring to close; a mega jam. The brief blasting "Volt Rush" makes a welcomed appearance opening ears, but fans will be salivating at the bands inclusion of their take on Led Zeppelin's (whose TMOQ bootleg the cover art/packaging is based on) "Communication Breakdown". While a fine, speedy cover the two album ending originals are even better. "Violence of the Red Sea" off of From The Ages, continues the Sabbath on speed style for nearly fifteen minutes as Mitchell reaffirms he is one of the fiercest guitarists going today while album closer "Acid Crusher" released as a standalone single in 2016 is a psych rock beast wrapping up a tremendous live collection of recent Earthless offerings. Recorded at The Great American Music Hall in San Francisco on March 1st, 2018 the trio were certainly in the groove. Like on their two other live albums, the stage is where Earthless are most comfortable and do their best work, any fan of adventurous excursions should give From The West a spin.